Casio has taken a couple stabs at making an Android Wear smartwatch, the latest WSD-F20 being all about the great outdoors. For its next effort, Casio is going a simpler route with the G-Shock G-Steel GST-B100, a hybrid smartwatch that's still all about exploration. For instance, the watch can automatically switch time zones as you travel. The sub-dial at 6 o'clock is a world clock - you can set it to whatever time zone you want - so if you're headed to London from San Francisco you can set it to GMT. Then when you arrive in London you can click the top right button on the watch to swap the times between the dials. The dial set at 9 o'clock looks like a tiny jet engine and is there to tell you either how much battery life you have or how much of your timer is left, depending on what you set in the companion app. Finally, the dial up north tells you the day of the week and what mode you're in. Unlike a lot of other hybrids the Casio doesn't do notifications, but there are other smarts here. For example, if you lose your phone there's also a phone finder that'll let your watch buzz your phone until you find it. There's an alarm and timer that you can adjust within the companion app too, plus an LED light you can use you illuminate your situation. This 101g, 58.1mm beast will get you about five months of battery life of "normal use," and there's a little solar panel that recharges the watch. The most expensive, and most fancy, G-Steel comes with a carbon fiber guard exterior with some nice design flourishes (it looks a little quilted, which is apparently a new fashion trend). 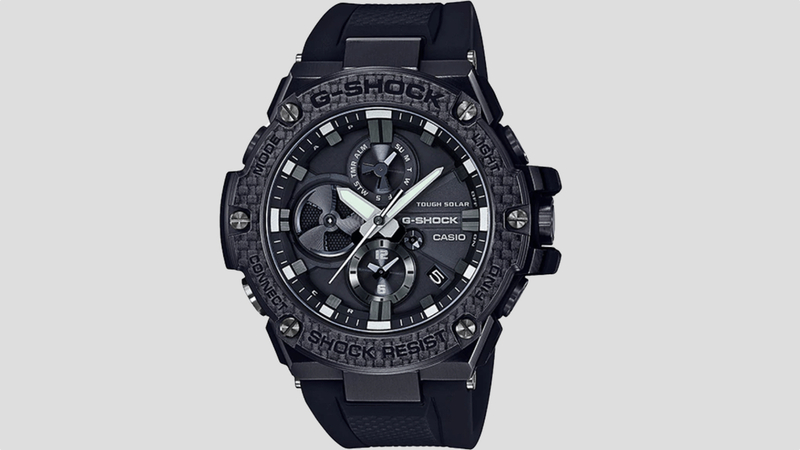 The bezel is also made with some "state-of-the-art" Torayca and Nanoalloy materials from Torayca Industries, which Casio says helps make this one shock resistant. Plus, there's a scratch-resistant sapphire glass protecting all of those dials. There are two other models that come in stainless steel, one with a more standard plastic-y band and another with a stainless steel band. They don't have the fanciness of the carbon fiber, but you'll still get all the connected features. And, well, that's pretty much it. There's no GPS or step counting or workout modes here - though there is water resistance to 200m. The G-Steel is all about enhancing a hybrid chronograph with some smart features, taking advantage of connectivity in small, appreciable ways rather than big features. The G-Steel starts at $320 for the stainless steel with standard band, goes up to $400 for the stainless steel with stainless steel band and then prices at $700 for the carbon fiber version. It's available now at select Macy's stores and Casio's online store.